The Columbia River is the largest river in the Pacific Northwest region of North America. The river rises in the Rocky Mountains of British Columbia, Canada. It flows northwest and then south into the US state of Washington, then turns west to form most of the border between Washington and the state of Oregon before emptying into the Pacific Ocean. The river is 1,243 miles (2,000Â km) long, and its largest tributary is the Snake River. Its drainage basin is roughly the size of France and extends into seven U.S.Â states and a Canadian province. By volume, the Columbia is the fourth-largest river in the United States; it has the greatest flow of any North American river draining into the Pacific. The river's heavy flow and its relatively steep gradient gives it tremendous potential for the generation of electricity. The 14Â hydroelectric dams on the Columbia's main stem and many more on its tributaries produce more hydroelectric power than those of any other North American river. The Columbia and its tributaries have been central to the region's culture and economy for thousands of years. They have been used for transportation since ancient times, linking the many cultural groups of the region. The river system hosts many species of anadromous fish, which migrate between freshwater habitats and the saline Pacific Ocean. These fishâ"especially the salmon speciesâ"provided the core subsistence for natives; in past centuries, traders from across western North America traveled to the Columbia to trade for fish. In the late 18thÂ century, a private American ship became the first non-indigenous vessel to enter the river; it was followed by a British explorer, who navigated past the Oregon Coast Range into the Willamette Valley. In the following decades, fur trading companies used the Columbia as a key transportation route. Overland explorers entered the Willamette Valley through the scenic but treacherous Columbia River Gorge, and pioneers began to settle the valley in increasing numbers, following both routes to enter it. Steamships along the river linked communities and facilitated trade; the arrival of railroads in the late 19thÂ century, many running along the river, supplemented these links. Since the late 19thÂ century, public and private sectors have heavily developed the river. The development, commonly referred to as taming or harnessing of the river, has been massive and multi-faceted. To aid ship and barge navigation, locks have been built along the lower Columbia and its tributaries, and dredging has opened, maintained, and enlarged shipping channels. Since the early 20thÂ century, dams have been built across the river for the purposes of power generation, navigation, irrigation, and flood control. Today, a dam-impounded reservoir lies along nearly every U.S.Â mile of the once free-flowing river, and much of the Canadian stretch has been impounded as well. Production of nuclear power has taken place at two sites along the river. Plutonium for nuclear weapons was produced for decades at the Hanford Site, which is now the most contaminated nuclear site in the U.S. All these developments have had a tremendous impact on river environments, mainly through industrial pollution and barriers to fish migration. The Columbia begins its 1,243-mile (2,000Â km) journey in the southern Rocky Mountain Trench in British Columbia (BC). Columbia LakeÂ â" 2,690 feet (820Â m) above sea levelÂ â" and the adjoining Columbia Wetlands form the river's headwaters. The trench is a broad, deep, and long glacial valley between the Canadian Rockies and the Columbia Mountains in BC. For its first 200 miles (320Â km), the Columbia flows northwest along the trench through Windermere Lake and the town of Invermere, a region known in British Columbia as the Columbia Valley, then northwest to Golden and into Kinbasket Lake. Rounding the northern end of the Selkirk Mountains, the river turns sharply south through a region known as the Big Bend Country, passing through Revelstoke Lake and the Arrow Lakes. Revelstoke, the Big Bend, and the Columbia Valley combined are referred to in BC parlance as the Columbia Country. Below the Arrow Lakes, the Columbia passes the cities of Castlegar, located at the Columbia's confluence with the Kootenay River, and Trail, two major population centers of the West Kootenay region. The Pend Oreille River joins the Columbia about 2 miles (3Â km) north of the U.S.â"Canada border. The Columbia enters eastern Washington flowing south and turning to the west at the Spokane River confluence. It marks the southern and eastern borders of the Colville Indian Reservation and the western border of the Spokane Indian Reservation. The river turns south after the Okanogan River confluence, then southeasterly near the confluence with the Wenatchee River in central Washington. This Câ'shaped segment of the river is also known as the "Big Bend". During the Missoula Floods 10,000 to 15,000Â years ago, much of the floodwater took a more direct route south, forming the ancient river bed known as the Grand Coulee. After the floods, the river found its present course, and the Grand Coulee was left dry. The construction of the Grand Coulee Dam in the mid-20thÂ century impounded the river, forming Lake Roosevelt, from which water was pumped into the dry coulee, forming the reservoir of Banks Lake. The river flows past The Gorge Amphitheatre, a prominent concert venue in the Northwest, then through Priest Rapids Dam, and then through the Hanford Nuclear Reservation. Entirely within the reservation is Hanford Reach, the only U.S.Â stretch of the river that is completely free-flowing, unimpeded by dams and not a tidal estuary. The Snake River and Yakima River join the Columbia in the Triâ'Cities population center. The Columbia makes a sharp bend to the west at the Washingtonâ"Oregon border. The river defines that border for the final 309 miles (497Â km) of its journey. The Deschutes River joins the Columbia near The Dalles. Between The Dalles and Portland, the river cuts through the Cascade Range, forming the dramatic Columbia River Gorge. No other river except for the Klamath completely breaches the Cascadesâ"the other rivers that flow through the range also originate in or very near the mountains. The headwaters and upper course of the Pit River flows through much of the Cascades; in contrast the Columbia cuts through the range nearly a thousand miles from its source in the Rocky Mountains. The gorge is known for its strong and steady winds, scenic beauty, and its role as an important transportation link. The river continues west, bending sharply to the north-northwest near Portland and Vancouver, Washington, at the Willamette River confluence. Here the river slows considerably, dropping sediment that might otherwise form a river delta. Near Longview, Washington and the Cowlitz River confluence, the river turns west again. The Columbia empties into the Pacific Ocean just west of Astoria, Oregon, over the Columbia Bar, a shifting sandbar that makes the river's mouth one of the most hazardous stretches of water to navigate in the world. Because of the danger and the many shipwrecks near the mouth, it acquired a reputation as the "Graveyard of Ships". The Columbia drains an area of about 258,000 square miles (670,000Â km2). Its drainage basin covers nearly all of Idaho, large portions of British Columbia, Oregon, and Washington, ultimately all of Montana west of the Continental Divide, and small portions of Wyoming, Utah, and Nevada; the total area is similar to the size of France. Roughly 745 miles (1,200Â km) of the river's length and 85Â percent of its drainage basin are in the U.S. The Columbia is the twelfth-longest river and has the sixth-largest drainage basin in the United States. In Canada, where the Columbia flows for 498 miles (801Â km) and drains 39,700 square miles (103,000Â km2), the river ranks 23rd in length, and its basin ranks 13th in size. The Columbia shares its name with nearby places, such as British Columbia, as well as with landforms and bodies of water. With an average flow at the mouth of about 265,000 cubic feet per second (7,500Â m3/s), the Columbia is the largest river by volume flowing into the Pacific from North America and is the fourth-largest by volume in the U.S. The average flow where the river crosses the international border between Canada and the United States is 99,000 cubic feet per second (2,800Â m3/s) from a drainage basin of 39,700 square miles (103,000Â km2). This amounts to about 15Â percent of the entire Columbia watershed. The Columbia's highest recorded flow, measured at The Dalles, was 1,240,000 cubic feet per second (35,000Â m3/s) in June 1894, before the river was dammed. The lowest flow recorded at The Dalles was 12,100 cubic feet per second (340Â m3/s) on April 16, 1968, and was caused by the initial closure of the John Day Dam, 28 miles (45Â km) upstream. The Dalles is about 190 miles (310Â km) from the mouth; the river at this point drains about 237,000 square miles (610,000Â km2) or about 91Â percent of the total watershed. Flow rates on the Columbia are affected by many large upstream reservoirs, many diversions for irrigation, and, on the lower stretches, reverse flow from the tides of the Pacific Ocean. The National Ocean Service issues water level observations for six tide gauges and tide forecasts for twenty-two locations along the river between the entrance at the North Jetty and the base of Bonneville Dam. When the rifting of Pangea, due to the process of plate tectonics, pushed North America away from Europe and Africa and into the Panthalassic Ocean (ancestor to the modern Pacific Ocean), the Pacific Northwest was not part of the continent. As the North American continent moved westward, the Farallon Plate subducted under its western margin. As the plate subducted, it carried along island arcs which were accreted to the North American continent, resulting in the creation of the Pacific Northwest between 150 and 90Â million years ago. The general outline of the Columbia Basin was not complete until between 60 and 40Â million years ago, but it lay under a large inland sea later subject to uplift. Between 40 and 20Â million years ago, in the Eocene and Miocene eras, tremendous volcanic eruptions frequently modified much of the landscape traversed by the Columbia. The lower reaches of the ancestral river passed through a valley near where Mount Hood later arose. Carrying sediments from erosion and erupting volcanoes, it built a 2-mile (3.2Â km) thick delta that underlies the foothills on the east side of the Coast Range near Vernonia in northwestern Oregon. Between 17Â million and 6Â million years ago, huge outpourings of flood basalt lava covered the Columbia River Plateau and forced the lower Columbia into its present course. The Cascade Range began to uplift during the early Pleistocene era (two million to 700,000Â years ago). Cutting through the uplifting mountains, the Columbia River created the Columbia River Gorge. The river and its drainage basin experienced some of the world's greatest known catastrophic floods toward the end of the last ice age. The periodic rupturing of ice dams at Glacial Lake Missoula resulted in the Missoula Floods, with discharges 10Â times the combined flow of all the rivers of the world, dozens of times over thousands of years. The exact number of floods is unknown, but geologists have documented at least 40; evidence suggests that they occurred between about 19,000 and 13,000Â years ago. The floodwaters rushed across eastern Washington, creating the channeled scablands, which are a complex network of dry canyon-like channels, or coulees that are often braided and sharply gouged into the basalt rock underlying the region's deep topsoil. Numerous flat-topped buttes with rich soil stand high above the chaotic scablands. Constrictions at several places caused the floodwaters to pool into large temporary lakes, such as Lake Lewis, in which sediments were deposited. Water depths have been estimated at 1,250 feet (380Â m) at Wallula Gap, 830 feet (250Â m) at Bonneville Dam, and 400 feet (120Â m) over modern Portland, Oregon. Sediments were also deposited when the floodwaters slowed in the broad flats of the Quincy, Othello, and Pasco Basins. The floods' periodic inundation of the lower Columbia River Plateau deposited rich sediments; 21st-century farmers in the Willamette Valley "plow fields of fertile Montana soil and clays from Washington's Palouse". Over the last several thousand years a series of large landslides have occurred on the north side of the Columbia River Gorge, sending massive amounts of debris south from Table Mountain and Greenleaf Peak into the gorge near the present site of Bonneville Dam. The most recent and significant is known as the Bonneville Slide, which formed a massive earthen dam, filling 3.5 miles (5.6Â km) of the river's length. Various studies have placed the date of the Bonneville Slide anywhere between 1060 and 1760 AD; the idea that the landslide debris present today was formed by more than one slide is relatively recent and may explain the large range of estimates. It has been suggested that if the later dates are accurate there may be a link with the 1700 Cascadia earthquake. The pile of debris resulting from the Bonneville Slide blocked the river until rising water finally washed away the sediment. It is not known how long it took the river to break through the barrier; estimates range from several months to several years. Much of the landslide's debris remained, forcing the river about 1.5 miles (2.4Â km) south of its previous channel and forming the Cascade Rapids. 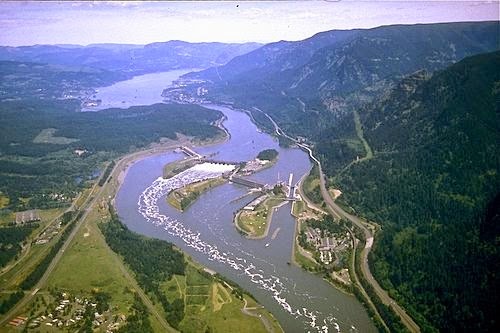 In 1938, the construction of Bonneville Dam inundated the rapids as well as the remaining trees that could be used to refine the estimated date of the landslide. In 1980, the eruption of Mount St.Â Helens deposited large amounts of sediment in the lower Columbia, temporarily reducing the depth of the shipping channel by 26 feet (7.9Â m). Humans have inhabited the Columbia's watershed for more than 15,000Â years, with a transition to a sedentary lifestyle based mainly on salmon starting about 3,500Â years ago. In 1962, archaeologists found evidence of human activity dating back 11,230Â years at the Marmes Rockshelter, near the confluence of the Palouse and Snake rivers in eastern Washington. In 1996 the skeletal remains of a 9,000-year-old prehistoric man (dubbed Kennewick Man) were found near Kennewick, Washington. The discovery rekindled debate in the scientific community over the origins of human habitation in North America and sparked a protracted controversy over whether the scientific or Native American community was entitled to possess and/or study the remains. Many different Native Americans and First Nations peoples have a historical and continuing presence on the Columbia. South of the Canadaâ"U.S.Â border, the Colville, Spokane, Coeur d'Alene, Yakama, Nez Perce, Cayuse, Palus, Umatilla, Cowlitz, and the Confederated Tribes of Warm Springs live along the U.S. stretch. Along the upper Snake River and Salmon River, the Shoshone Bannock tribes are present. The Sinixt or Lakes people lived on the lower stretch of the Canadian portion, while above that the Shuswap people (Secwepemc in their own language) reckon the whole of the upper Columbia east to the Rockies as part of their territory. The Canadian portion of the Columbia Basin outline the Traditional homelands of the Canadian Kootenay- Ktunaxa. The Chinook tribe, which is not federally recognized, who live near the lower Columbia River, call it Wimahl in the Chinookan language. and Nchâi-WÃ na to the Sahaptin-speaking peoples of its middle course in present-day Washington; The river is known as swah'netk'qhu by the Sinixt people, who live in the area of the Arrow Lakes in the river's upper reaches in Canada. All three terms essentially mean "the big river". Oral histories describe the formation and destruction of the Bridge of the Gods, a land bridge that connected the Oregon and Washington sides of the river in the Columbia River Gorge. The bridge, which aligns with geological records of the Bonneville Slide, was described in some stories as the result of a battle between gods, represented by Mount Adams and Mount Hood, in their competition for the affection of a goddess, represented by Mount St.Â Helens. Native American stories about the bridge differ in their details but agree in general that the bridge permitted increased interaction between tribes on the north and south sides of the river. Natives of the region encountered foreigners at several times and places during the 18thÂ and 19thÂ centuries. European and American vessels explored the coastal area around the mouth of the river in the late 18thÂ century, trading with local natives. The contact would prove devastating to the Indian tribes; a large portion of their population was wiped out by a smallpox epidemic. Canadian explorer Alexander Mackenzie crossed what is now interior British Columbia in 1793. From 1805 to 1807, the Lewis and Clark Expedition entered the Oregon Country along the Clearwater and Snake rivers, and encountered numerous small settlements of natives. Their records recount tales of hospitable traders who were not above stealing small items from the visitors. They also noted brass teakettles, a British musket, and other artifacts that had been obtained in trade with coastal tribes. From the earliest contact with westerners, the natives of the mid- and lower Columbia were not tribal, but instead congregated in social units no larger than a village, and more often at a family level; these units would shift with the season as people moved about, following the salmon catch up and down the river's tributaries. Sparked by the 1848 Whitman Massacre, a number of violent battles were fought between American settlers and the region's natives. The subsequent Indian Wars, notably the Yakima War, decimated the native population and removed much land from native control. As years progressed, the right of natives to fish along the Columbia became the central issue of contention with the states, commercial fishers, and private property owners. The U.S. Supreme Court upheld fishing rights in landmark cases in 1905 and 1918, as well as the 1974 case United States v. Washington, commonly called the Boldt Decision. Fish were central to the culture of the region's natives, both as sustenance and as part of their religious beliefs. Natives drew fish from the Columbia at several major sites, which also served as trading posts. Celilo Falls, located east of the modern city of The Dalles, was a vital hub for trade and the interaction of different cultural groups, being used for fishing and trading for 11,000Â years. Prior to contact with westerners, villages along this 9-mile (14Â km) stretch may have at times had a population as great as 10,000. The site drew traders from as far away as the Great Plains. The Cascades Rapids of the Columbia River Gorge, and Kettle Falls and Priest Rapids in eastern Washington, were also major fishing and trading sites. In prehistoric times the Columbia's salmon and steelhead runs numbered an estimated annual average of 10 to 16Â million fish. In comparison, the largest run since 1938 was in 1986, with 3.2Â million fish entering the Columbia. The annual catch by natives has been estimated at 42Â million pounds (19,000Â t). The most important and productive native fishing site was located at Celilo Falls, which was perhaps the most productive inland fishing site in North America. The falls were located at the border between Chinookan- and Sahaptian-speaking peoples and served as the center of an extensive trading network across the Pacific Plateau. Celilo was the oldest continuously inhabited community on the North American continent. Salmon canneries established by white settlers beginning in 1866 had a strong negative impact on the salmon population, and in 1908 U.S. President Theodore Roosevelt observed that the salmon runs were but a fraction of what they had been 25Â years prior. As river development continued in the 20thÂ century, each of these major fishing sites was flooded by a dam, beginning with Cascades Rapids in 1938. The development was accompanied by extensive negotiations between natives and U.S. government agencies. The Confederated Tribes of Warm Springs, a coalition of various tribes, adopted a constitution and incorporated after the 1938 completion of the Bonneville Dam flooded Cascades Rapids; Still, in the 1930s, there were natives who lived along the river and fished year round, moving along with the fish's migration patterns throughout the seasons. The Yakama were slower to do so, organizing a formal government in 1944. In the 21stÂ century, the Yakama, Nez Perce, Umatilla, and Warm Springs tribes all have treaty fishing rights along the Columbia and its tributaries. In 1957 Celilo Falls was submerged by the construction of The Dalles Dam, and the native fishing community was displaced. The affected tribes received a $26.8Â million settlement for the loss of Celilo and other fishing sites submerged by The Dalles Dam. The Confederated Tribes of Warm Springs used part of its $4Â million settlement to establish the Kah-Nee-Ta resort south of Mount Hood. Some historians believe that Japanese or Chinese vessels blown off course reached the Northwest Coast long before Europeansâ"possibly as early as 219Â BCE. It is unknown whether they landed near the Columbia. Evidence exists that Spanish castaways reached the shore in 1679 and traded with the Clatsop; if these were indeed the first Europeans to see the Columbia, they failed to send word home to Spain. In the 18thÂ century, there was strong interest in discovering a Northwest Passage that would permit navigation between the Atlantic (or inland North America) and the Pacific Ocean. Many ships in the area, especially those under Spanish and British command, searched the northwest coast for a large river that might connect to Hudson Bay or the Missouri River. The first documented European discovery of the Columbia River was that of Bruno de Heceta, who in 1775 sighted the river's mouth. On the advice of his officers, he did not explore it, as he was short-staffed and the current was strong. He considered it a bay, and called it Ensenada de AsunciÃ³n. Later Spanish maps based on his discovery showed a river, labeled Rio de San Roque, or an entrance, called Entrada de Hezeta. Following Heceta's reports, British maritime fur trader Captain John Meares searched for the river in 1788 but concluded that it did not exist. He named Cape Disappointment for the non-existent river, not realizing the cape marks the northern edge of the river's mouth. On May 12, 1792, Gray returned south and crossed the Columbia Bar, becoming the first explorer to enter the river. Gray's fur trading mission had been financed by Boston merchants, who outfitted him with a private vessel named Columbia Rediviva; he named the river after the ship on May 18. Gray spent nine days trading near the mouth of the Columbia, then left without having gone beyond 13 miles (21Â km) upstream. The farthest point reached was Grays Bay at the mouth of Grays River. Gray's discovery of the Columbia River was later used by the United States to support its claim to the Oregon Country, which was also claimed by Russia, Great Britain, Spain and other nations. In October 1792, Vancouver sent Lieutenant William Robert Broughton, his second-in-command, up the river. Broughton got as far as the Sandy River at the western end of the Columbia River Gorge, about 100 miles (160Â km) upstream, sighting and naming Mount Hood. Broughton formally claimed the river, its drainage basin, and the nearby coast for Britain. In contrast, Gray had not made any formal claims on behalf of the United States. Because the Columbia was at the same latitude as the headwaters of the Missouri River, there was some speculation that Gray and Vancouver had discovered the long-sought Northwest Passage. A 1798 British map showed a dotted line connecting the Columbia with the Missouri. However, when the American explorers Meriwether Lewis and William Clark charted the vast, unmapped lands of the American West in their overland expedition (1803â"05), they found no passage between the rivers. After crossing the Rocky Mountains, Lewis and Clark built dugout canoes and paddled down the Snake River, reaching the Columbia near the present-day Tri-Cities, Washington. They explored a few miles upriver, as far as Bateman Island, before heading down the Columbia, concluding their journey at the river's mouth and establishing Fort Clatsop, a short-lived establishment that was occupied for less than three months. Canadian explorer David Thompson, of the North West Company, spent the winter of 1807â"08 at Kootenae House near the source of the Columbia at present-day Invermere, British Columbia. Over the next few years he explored much of the river and its northern tributaries. In 1811 he traveled down the Columbia to the Pacific Ocean, arriving at the mouth just after John Jacob Astor's Pacific Fur Company had founded Astoria. On his return to the north, Thompson explored the one remaining part of the river he had not yet seen, becoming the first European-American to travel the entire length of the river. In the Treaty of 1818 the United States and Britain agreed that both nations were to enjoy equal rights in Oregon Country for 10Â years. By 1828, when the so-called "joint occupation" was renewed for an indefinite period, it seemed probable that the lower Columbia River would in time become the border. For years the Hudson's Bay Company successfully maintained control of the Columbia River and American attempts to gain a foothold were fended off. In the 1830s, however, American religious missions were established at several locations in the lower Columbia River region. And in the 1840s a mass migration of American settlers undermined British control. The Hudson's Bay Company tried to maintain dominance by shifting from the fur trade, which was in sharp decline, to exporting other goods such as salmon and lumber. Colonization schemes were attempted, but failed to match the scale of American settlement. Americans generally settled south of the Columbia, mainly in the Willamette Valley. The Hudson's Bay Company tried to establish settlements north of the river, but nearly all the British colonists moved south to the Willamette Valley. The hope that the British colonists might dilute the American flavor of the valley failed in the face of the overwhelming number of American settlers. These developments rekindled the issue of "joint occupation" and the boundary dispute. While some British interests, especially the Hudson's Bay Company, fought for a boundary along the Columbia River, the Oregon Treaty of 1846 set the boundary at the 49thÂ parallel. The Columbia River did become the border between the U.S. territories of Oregon and Washington. Oregon became a U.S. state in 1859, Washington in 1889. By the turn of the 20thÂ century, the difficulty of navigating the Columbia was seen as an impediment to the economic development of the Inland Empire region east of the Cascades. The dredging and dam building that followed would permanently alter the river, disrupting its natural flow but also providing electricity, irrigation, navigability and other benefits to the region. The shifting Columbia Bar makes passage between the river and the Pacific Ocean difficult and dangerous, and numerous rapids along the river hinder navigation. Pacific Graveyard, a 1964 book by James A. Gibbs, describes the numerous shipwrecks near the mouth of the Columbia. Jetties, first constructed in 1886, extend the river's channel into the ocean. Strong currents and the shifting sandbar remain a threat to ships entering the river and necessitate continuous maintenance of the jetties. In 1891 the Columbia was dredged to enhance shipping. The channel between the ocean and Portland and Vancouver was deepened from 17 feet (5.2Â m) to 25 feet (7.6Â m). The Columbian called for the channel to be deepened to 40 feet (12Â m) as early as 1905, but that depth was not attained until 1976. Cascade Locks and Canal were first constructed in 1896 around the Cascades Rapids, enabling boats to travel safely through the Columbia River Gorge. The Celilo Canal, bypassing Celilo Falls, opened to river traffic in 1915. In the mid-20thÂ century, the construction of dams along the length of the river submerged the rapids beneath a series of reservoirs. An extensive system of locks allowed ships and barges to pass easily from one reservoir to the next. A navigation channel reaching to Lewiston, Idaho, along the Columbia and Snake rivers, was completed in 1975. One of the main commodities is wheat, mainly for export. More than 40Â percent of all US wheat exports are barged on the Columbia River. The 1980 eruption of Mount St. Helens caused mudslides in the area, which reduced the Columbia's depth by 25 feet (7.6Â m) for a 4-mile (6.4Â km) stretch, disrupting Portland's economy. In 1999, Congress authorized deepening the channel between Portland and Astoria from 40Â to 43 feet (12â"13Â m), which will make it possible for large container and grain ships to reach Portland and Vancouver. However, the project has met opposition because of concerns about stirring up toxic sediment on the riverbed. Portland-based Northwest Environmental Advocates brought a lawsuit against the Army Corps of Engineers, but it was rejected by the Ninth U.S.Â Circuit Court of Appeals in August 2006. The project includes measures to mitigate environmental damage; for instance, the U.S. Army Corps of Engineers must restore 12 times the area of wetland damaged by the project. In early 2006, the Corps spilled 50 US gallons (190Â L) of hydraulic oil into the Columbia, drawing further criticism from environmental organizations. Work on the project began in 2005 and concluded in 2010. The project's cost is estimated at $150Â million. The federal government is paying 65Â percent, Oregon and Washington are paying $27Â million each, and six local ports are also contributing to the cost. In 1902, the United States Bureau of Reclamation was established to aid in the economic development of arid western states. One of its major undertakings was building Grand Coulee Dam to provide irrigation for the 600Â thousand acres (2,400Â km2) of the Columbia Basin Project in central Washington. With the onset of World War II, the focus of dam construction shifted to production of hydroelectricity. Irrigation efforts resumed after the war. River development occurred within the structure of the 1909 International Boundary Waters Treaty between the U.S. and Canada. The United States Congress passed the Rivers and Harbors Act of 1925, which directed the Army Corps of Engineers and the Federal Power Commission to explore the development of the nation's rivers. This prompted agencies to conduct the first formal financial analysis of hydroelectric development; the reports produced by various agencies were presented in House DocumentÂ 308. Those reports, and subsequent related reports, are referred to as 308 Reports. In the 1960s, the United States and Canada signed the Columbia River Treaty, which focused on flood control and the maximization of downstream power generation. Canada agreed to build dams and provide reservoir storage, and the United States agreed to deliver to Canada one-half of the increase in U.S.Â downstream power benefits as estimated five years in advance. Canada's obligation was met by building three dams (two on the Columbia, and one on the Duncan River), the last of which was completed in 1973. Today the main stem of the Columbia River has 14Â dams, of which three are in Canada and 11 in the U.S. Four mainstem dams and four lower Snake River dams contain navigation locks to allow ship and barge passage from the ocean as far as Lewiston, Idaho. The river system as a whole has more than 400Â dams for hydroelectricity and irrigation. The dams address a variety of demands, including flood control, navigation, stream flow regulation, storage and delivery of stored waters, reclamation of public lands and Indian reservations, and the generation of hydroelectric power. The larger U.S. dams are owned and operated by the federal government (some by the Army Corps of Engineers and some by the Bureau of Reclamation), while the smaller dams are operated by public utility districts, and private power companies. The federally operated system is known as the Federal Columbia River Power System, which includes 31Â dams on the Columbia and its tributaries. The system has altered the seasonal flow of the river in order to meet higher electricity demands during the winter. At the beginning of the 20thÂ century, roughly 75Â percent of the Columbia's flow occurred in the summer, between April and September. By 1980, the summer proportion had been lowered to about 50Â percent, essentially eliminating the seasonal pattern. The Bureau of Reclamation's Columbia Basin Project focused on the generally dry region of central Washington known as the Columbia Basin, which features rich loess soil. Several groups developed competing proposals, and in 1933, President Franklin D. Roosevelt authorized the Columbia Basin Project. The Grand Coulee Dam was the project's central component; upon completion, it pumped water up from the Columbia to fill the formerly dry Grand Coulee, forming Banks Lake. By 1935, the intended height of the dam was increased from a range between 200 and 300 feet (61 and 91Â m) to 500 feet (150Â m), a height that would extend the lake impounded by the dam all the way to the Canadian border; the project had grown from a local New Deal relief measure to a major national project. The project's initial purpose was irrigation, but the onset of World WarÂ II created a high demand for electricity, mainly for aluminum production and for the development of nuclear weapons at the Hanford Site. Irrigation began in 1951. The project provides water to more than 670Â thousand acres (2,700Â km2) of fertile but arid land in central Washington, transforming the region into a major agricultural center. Important crops include orchard fruit, potatoes, alfalfa, mint, beans, beets, and wine grapes. Since 1750, the Columbia has experienced six multi-year droughts. The longest, lasting 12Â years in the midâ'19th century, reduced the river's flow to 20Â percent below average. Scientists have expressed concern that a similar drought would have grave consequences in a region so dependent on the Columbia. In 1992â"1993, a lesser drought affected farmers, hydroelectric power producers, shippers, and wildlife managers. The Columbia's heavy flow and extreme elevation drop over a short distance, 2.16 feet per mile (40.9Â cm/km), give it tremendous capacity for hydroelectricity generation. In comparison, the Mississippi drops less than 0.65 feet per mile (12.3Â cm/km). The Columbia alone possesses one-third of the United States's hydroelectric potential. The largest of the 150Â hydroelectric projects, the Grand Coulee Dam and the Chief Joseph Dam, are also the largest in the United States and among the largest in the world. Inexpensive hydropower supported the location of a large aluminum industry in the region, because the reduction of metallic aluminum from bauxite ore requires large amounts of electricity. Until 2000, the Northwestern United States produced up to 17Â percent of the world's aluminum and 40Â percent of the aluminum produced in the U.S. But the commoditization of power in the early 21st century, coupled with drought that reduced the generation capacity of the river, damaged the industry. By 2001, Columbia River aluminum producers had idled 80Â percent of its production capacity, and by 2003, the entire United States produced only 15Â percent of the world's aluminum, with many smelters along the Columbia having gone dormant or out of business. Downriver of Grand Coulee, each dam's reservoir is closely regulated by the Bonneville Power Administration (BPA), the U.S.Â Army Corps of Engineers, and various Washington public utility districts to ensure flow, flood control, and power generation objectives are met. Increasingly, hydro-power operations are required to meet standards under the U.S.Â Endangered Species Act and other agreements to manage operations to minimize impacts on salmon and other fish, and some conservation and fishing groups support removing four dams on the lower Snake River, the largest tributary of the Columbia. In 1941, the BPA hired Oklahoma folksinger Woody Guthrie to write songs for a documentary film promoting the benefits of hydropower. In the month he spent traveling the region Guthrie wrote 26Â songs, which have become an important part of the cultural history of the region. The Columbia supports several species of anadromous fish that migrate between the Pacific Ocean and fresh water tributaries of the river. Sockeye salmon, Coho and Chinook (also known as "king") salmon, and steelhead, all of the genus Oncorhynchus, are ocean fish that migrate up the rivers at the end of their life cycles to spawn. White sturgeon, which take 15 to 25Â years to mature, typically migrate between the ocean and the upstream habitat several times during their lives. Salmon populations declined dramatically after the establishment of canneries in 1867. By 1908, there was widespread concern about the decline of salmon and sturgeon. In that year, the people of Oregon passed two laws under their newly instituted program of Citizens' Initiatives limiting fishing on the Columbia and other rivers. Then in 1948, another initiative banned the use of seine nets (devices already used by Native Americans, and refined by later settlers) altogether. In 1994, the salmon catch was smaller than usual in the rivers of Oregon, Washington, and British Columbia, causing concern among commercial fishermen, government agencies, and tribal leaders. U.S. government intervention, to which the states of Alaska, Idaho, and Oregon objected, included an 11-day closure of an Alaska fishery. In April 1994 the Pacific Fisheries Management Council unanimously approved the strictest regulations in 18Â years, banning all commercial salmon fishing for that year from Cape Falcon north to the Canadian border. In the winter of 1994, the return of coho salmon far exceeded expectations, which was attributed in part to the fishing ban. Also in 1994, United States Secretary of the Interior Bruce Babbitt first proposed the removal of several Pacific Northwest dams because of their impact on salmon spawning. The Northwest Power Planning Council approved a plan that provided more water for fish and less for electricity, irrigation, and transportation. Environmental advocates have called for the removal of certain dams in the Columbia system in the years since. Of the 227Â major dams in the Columbia River drainage basin, the four Washington dams on the lower Snake River are often identified for removal, notably in an ongoing lawsuit concerning a Bush administration plan for salmon recovery. These dams and reservoirs currently limit the recovery of upriver salmon runs to Idaho's Salmon and Clearwater rivers. Historically, the Snake produced over 1.5Â million spring and summer Chinook salmon, a number that has dwindled to several thousand in recent years. Idaho Power Company's Hells Canyon dams have no fish ladders (and do not pass juvenile salmon downstream), and thus allow no steelhead or salmon to migrate above Hells Canyon. In 2007, the destruction of the Marmot Dam on the Sandy River was the first dam removal in the system. Other Columbia Basin dams that have been removed include Condit Dam on Washington's White Salmon River, and the Milltown Dam on the Clark Fork in Montana. In southeastern Washington, a 50-mile (80Â km) stretch of the river passes through the Hanford Site, established in 1943 as part of the Manhattan Project. The site served as a plutonium production complex, with nine nuclear reactors and related facilities located on the banks of the river. From 1944 to 1971, pump systems drew cooling water from the river and, after treating this water for use by the reactors, returned it to the river. Before being released back into the river, the used water was held in large tanks known as retention basins for up to six hours. Longer-lived isotopes were not affected by this retention, and several terabecquerels entered the river every day. By 1957, the eight plutonium production reactors at Hanford dumped a daily average of 50,000Â curies of radioactive material into the Columbia. These releases were kept secret by the federal government until the release of declassified documents in the late 1980s. Radiation was measured downstream as far west as the Washington and Oregon coasts. The nuclear reactors were decommissioned at the end of the Cold War, and the Hanford site is now the focus of the world's largest environmental cleanup, managed by the Department of Energy under the oversight of the Washington Department of Ecology and the Environmental Protection Agency. Nearby aquifers contain an estimated 270Â billionÂ USÂ gallons (1Â billionÂ m3) of groundwater contaminated by high-level nuclear waste that has leaked out of Hanford's massive underground storage tanks. As of 2008, 1Â millionÂ USÂ gallons (3,785Â m3) of highly radioactive waste is traveling through groundwater toward the Columbia River. This waste is expected to reach the river in 12 to 50Â years if cleanup does not proceed on schedule. Most of the Columbia's drainage basin (which, at 258,000 square miles or 670,000 square kilometres, is about the size of France) lies roughly between the Rocky Mountains on the east and the Cascade Mountains on the west. In the United States and Canada the term watershed is often used to mean drainage basin. The term Columbia Basin is used to refer not only to the entire drainage basin but also to subsets of the river's full watershed, such as the relatively flat and unforested area in eastern Washington bounded by the Cascades, the Rocky Mountains, and the Blue Mountains. Within the watershed are diverse landforms including mountains, arid plateaus, river valleys, rolling uplands, and deep gorges. Grand Teton National Park lies in the watershed, as well as parts of Yellowstone National Park, Glacier National Park, Mount Rainier National Park, and North Cascades National Park. Canadian National Parks in the watershed include Kootenay National Park, Yoho National Park, Glacier National Park, and Mount Revelstoke National Park. Hells Canyon, the deepest gorge in North America, and the Columbia Gorge are in the watershed. Vegetation varies widely, ranging from western hemlock and western redcedar in the moist regions to sagebrush in the arid regions. The watershed provides habitat for 609Â known fish and wildlife species, including the bull trout, bald eagle, gray wolf, grizzly bear, and Canada lynx. The World Wide Fund for Nature (WWF) divides the waters of the Columbia and its tributaries into three freshwater ecoregions, naming them Columbia Glaciated, Columbia Unglaciated, and Upper Snake. The Columbia Glaciated ecoregion, making up about a third of the total watershed, lies in the north and was covered with ice sheets during the Pleistocene. The ecoregion includes the mainstem Columbia north of the Snake River and tributaries such as the Yakima, Okanagan, Pend Oreille, Clark Fork, and Kootenay rivers. The effects of glaciation include a number of large lakes and a relatively low diversity of freshwater fish. The Upper Snake ecoregion is defined as the Snake River watershed above Shoshone Falls, which totally blocks fish migration. This region has 14Â species of fish, many of which are endemic. The Columbia Unglaciated ecoregion makes up the rest of the watershed. It includes the mainstem Columbia below the Snake River and tributaries such as the Salmon, John Day, Deschutes, and lower Snake Rivers. Of the three ecoregions it is the richest in terms of freshwater species diversity. There are 35Â species of fish, of which four are endemic. There are also high levels of mollusk endemism. In 2000, about six million people lived within the Columbia's drainage basin. Of this total about 2.4Â million people lived in Oregon, 1.7Â million in Washington, 1Â million in Idaho, half a million in British Columbia, and 0.4Â million in Montana. Population in the watershed has been rising for many decades and is projected to rise to about 10Â million by 2030. The highest population densities are found west of the Cascade Mountains along the I-5 corridor, especially in the Portland-Vancouver urban area. High densities are also found around Spokane, Washington, and Boise, Idaho. Although much of the watershed is rural and sparsely populated, areas with recreational and scenic values are growing rapidly. The central Oregon county of Deschutes is the fastest-growing in the state. Populations have also been growing just east of the Cascades in central Washington around the city of Yakima and the Tri-Cities area. Projections for the coming decades assume growth throughout the watershed, including the interior. The Canadian part of the Okanagan subbasin is also growing rapidly. Climate varies greatly from place to place within the watershed. Elevation ranges from sea level at the river mouth to more than 14,000 feet (4,300Â m) in the mountains, and temperatures vary with elevation. The highest peak is Mount Rainier, at 14,411 feet (4,392Â m). High elevations have cold winters and short cool summers; interior regions are subject to great temperature variability and severe droughts. Over some of the watershed, especially west of the Cascade Mountains, precipitation maximums occur in winter, when Pacific storms come ashore. Atmospheric conditions block the flow of moisture in summer, which is generally dry except for occasional thunderstorms in the interior. In some of the eastern parts of the watershed, especially shrub-steppe regions with Continental climate patterns, precipitation maximums occur in early summer. Annual precipitation varies from more than 100 inches (250Â cm) a year in the Cascades to less than 8 inches (20Â cm) in the interior. Much of the watershed gets less than 12 inches (30Â cm) a year. To the southeast, in western Wyoming, another divide separates the Columbia watershed from the Coloradoâ"Green watershed, which empties into the Gulf of California. The Columbia, Colorado, and Mississippi watersheds meet at Three Waters Mountain in the Wind River Range of Wyoming. To the south, in Oregon, Nevada, Utah, Idaho, and Wyoming, the Columbia watershed is divided from the Great Basin, whose several watersheds are endorheic, not emptying into any ocean but rather drying up or sinking into sumps. Great Basin watersheds that share a border with the Columbia watershed include Harney Basin, Humboldt River, and Great Salt Lake. The associated triple divide points are Commissary Ridge North, Wyoming, and Sproats Meadow Northwest, Oregon. To the north, mostly in British Columbia, the Columbia watershed borders the Fraser River watershed. To the west and southwest the Columbia watershed borders a number of smaller watersheds that drain to the Pacific Ocean, such as the Klamath River in Oregon and California and the Puget Sound Basin in Washington. The Columbia receives more than 60Â significant tributaries. The four largest that empty directly into the Columbia (measured either by discharge or by size of watershed) are the Snake River (mostly in Idaho), the Willamette River (in northwest Oregon), the Kootenay River (mostly in British Columbia), and the Pend Oreille River (mostly in northern Washington and Idaho, also known as the lower part of the Clark Fork). Each of these four averages more than 20,000 cubic feet per second (570Â m3/s) and drains an area of more than 20,000 square miles (52,000Â km2). The Snake is by far the largest tributary. Its watershed of 108,000 square miles (280,000Â km2) is larger than the state of Idaho. Its discharge is roughly a third of the Columbia's at the rivers' confluence, but compared to the Columbia upstream of the confluence the Snake is longer (113%) and has a larger drainage basin (104%). University of Washington Libraries Digital CollectionsÂ â" Tollman and Canaris Photographs Photographs document the salmon fishing industry on the southern Washington coast and in the lower Columbia River around the year 1897 and offer valuable insights into the history of commercial salmon fishing and the techniques used at the beginning of the 20th century.